Please submit all sightings to sightings@weirwood.me.uk , thank you! 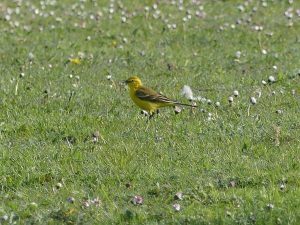 Dam End:- 2 Yellow Wagtails in horse paddock, 2 Common Whitethroats, 8 Blackcap, 5 Chiffchaff, 1 Reed Bunting, 2 Song Thrush, 2 House Martins, 1 Coot on lagoon, 1 Mistle Thrush carrying food, 4 Egytpian Geese, 1 Common Gull, 2 Jay, 1 Mandarin, 1 singing Grey Wagtail. North Bank:- 3 Common Whitethroat, 12 Blackcap, 11 Chiffchaff, 1 Goldcrest. Dam End:- 1 Wheatear on dam. Whillet’s:- 1 Whitethroat, 7 Blackcap, 3 Chiffchaff, 1 Reed Bunting, 1 Treecreeper, 1 Kestrel, 1 Lizard, 1 Orange Tip. Dam End:- at 11am five Whimbrel flew up the reservoir towards the dam eventually landing in the ploughed field by the sailing club, 1 Kestrel, 1 Lesser Black-backed Gull. Dam End:- 1 Common Tern, 2 Green Sandpipers, 2m Gadwall, 1 Mute Swan, 2 Egyptian Geese, 2 Canada Geese, 1 Grey Wagtail, 2 Mistle Thrush, 5 singing Blackcaps, 6 singing Chiffchaff, Sparrowhawk, Green Woodpecker heard, 1 Mink. West End:- Red Kite, female Sparrowhawk, male Mandarin, 1 House Martin, 15 Swallows. Dam End:- At 7pm this evening the Black Tern was joined by two adult Little Gulls one was in stunning summer plumage, 5 Egyptian Geese, 1 Red Kite. Dam End:- 1 Black Tern. Dam End:- 1 Black Tern, 3 Egyptian Geese, 1 Coot, 6 Pied Wagtail, 1 Grey Wagtail, 2 Black-headed Gulls.